That Putin’s good, you know that? He’s the pro from Dover when it comes to this kind of thing. 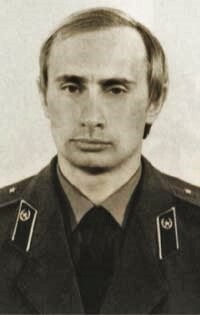 That KGB training wasn’t wasted on him. He and his buddies at the Kremlin have to be pinching themselves constantly, so delighted they must be that, against all the odds, the thing they tried to bring about — sure as they must have been that it was a hopeless task — actually came to pass. There’s no way to know to what extent their interference contributed to the result, but they tried, and it happened. This entry was posted in 2016 Presidential, Donald Trump, Russia on July 9, 2017 by Brad Warthen. No mystery about the straight face. Why? For exactly those perverted reasons you and some of your readers did not laugh when FBI Director Comey declared Secretary of State Hillary Clinton did not realize she committed a felony violation of Section 793(f) of the federal penal code (Title 18): With lawful access to highly classified information she acted with gross negligence in removing and causing it to be removed it from its proper place of custody, and she transmitted it and caused it to be transmitted to others not authorized to have it, in patent violation of her trust. Pretty simple really. Any observation of Trump acting juvenile, clueless, foolish or violent can ALWAYS be answered by bringing up Hillary Clinton’s e-mail. It’s a go-to, intellectually lazy deflection tactic that never goes out of style. If Hillary is ever duly prosecuted, you would be quite correct, Bud — her guilt will go down in political history. But, no deflection tactics are LAZIER than the left’s perpetual streams of fake news and related namecalling. The longer Democrats remain in denial, the stronger independents and Reagan Dems and Republicans become. So, we appreciate the steady, nonsensical choruses of fake news, strident namecalling and denials of corruption and incompetence which hurt the Dems and actually helps Trump. Juan, what you’re saying is irrelevant. Period. Some of those statements are true. Some are false. But none of them are relevant to Brad’s post. Same thing can be said about your comments regarding Hillarys emails. Weren’t the primaries fixed for Hillary? When asked, Hillary seemed pretty straight faced. First, I’m not following you. Second, what’s the logic behind this thing Trump supporters do whenever confronted with how awful their guy is: “Hillary, Hillary, Hillary!” What on Earth does she have to do with ANY of the things we’re talking about here in 2017? Heads up: Trump won the election. Hillary lost, and is now a footnote of history. None of the things going on now have the SLIGHTEST thing to do with her. What do you think that accomplishes? In what way do you think it answers the questions before us? “What on Earth does she have to do with ANY of the things we’re talking about here in 2017?” – Brad W.
Are we still a nation of laws? Just token accountability for insiders under the Obama administration, and you seriously ask what overdue due process (not Congressional dramatics) could have to do with proper governance of the U.S? Obama is not president either, yet his involvement in such 2017 questions has been noted in the press almost weekly as Why should we have to forget her crimes though more serious than any Trump has been tied to since his inauguration? Your criterion for relevance to 2017 questions only suffers from an incredible degree of bent partisanship. “Partisanship?” The thing I hate, the thing I rail against, earning me all sorts of opprobrium from the partisans? He managed to hold it until everyone left the room, then he collapsed to the floor giggling helplessly. Just saw half of Oliver Stone’s interviews with Putin; wished I had started with the fourth one so I could have at least seen a bit of the last one, recorded fairly recently, but I was at a relative’s house in Houston and had to leave too soon. I don’t have HBO, so will have to look for it elsewhere. As with all political interviews, the ‘can I believe any of this?’ question comes up every sentence, but as a whole, the interview was better than I thought it would be. Even Oliver Stone was better than I expected, and I didn’t expect much. But Putin was good in his role. Very, very good. A sly fox, I think. Still, it’s worth seeing; good background material. And by the way, so is the interview with the author of ‘The Anarchist’s Cookbook’–also on HBO, I think, but for very different reasons. How he views what he wrote almost 50 years later–his remorse (if that’s what it is, and I think it is), is fascinating.